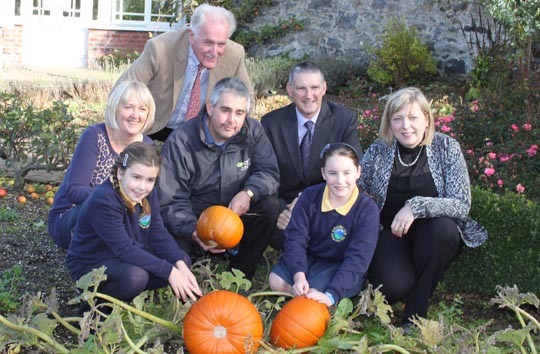 A talented team from Drumlins Integrated Primary School in Ballynahinch have been rewarded for their inspiring scarecrow creations with new saplings for their schools. The Drumlins IPS winning Scarecrow at the Airtricity Garden Festival earlier this year. The creative children were at CAFRE campus at Greenmount, Antrim, to celebrate their win in the Integrated Primary Schools’ Scarecrow competition at the 2013 Airtricity Garden Festival in Hillsborough in May. The competition, which has been running for eight years, is sponsored by Allianz and organised by Festival Director Claire Faulkner and the Integrated Education Fund. ‘Scarecrow Square’ has become a feature of the annual show, greeting visitors with a crowd of imaginative creatures from all over Northern Ireland. This year, the schools were invited to make scarecrows on the themes of storytellers or musicians, or simply to make a traditional figure. 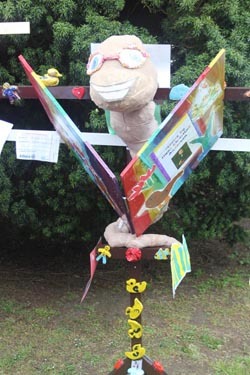 The Drumlins IPS’s characterful creation, Bookworm, took the Overall Winner award. The trees were kindly donated by CAFRE and after collecting their prize from the college’s Martin Wooster, the children joined pupils from other winning schools to explore the campus nature trail. The IEF is an independent charitable trust that targets financial support for the development and growth of integrated education. Its aim is to make integration, not separation, the norm in the Northern Ireland education system. On the basis of parental demand the Fund continues to support the establishment of more integrated school places, the transformation of existing non-integrated schools to integrated status and cross-community school initiatives that provide meaningful interaction between pupils, parents, staff and the wider community.